Embasmeroit de ses doulces aleines. Planer les montz, et montaigner les plaines. Announce the miracle which is my Goddess. Would perfume with its sweet breath. Makes mountains plains, and plains mountains. 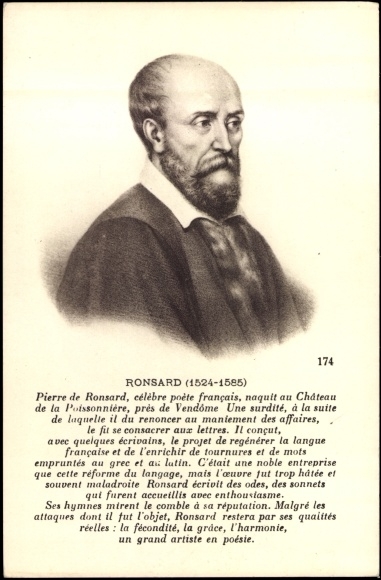 Though the metaphors seem plain enough, one of Ronsard’s early editors felt the need to explain that (for instance) that in line 7 he means ‘the eyebrows which are vaulted like the sky, and hence two heavens’; and also to explain the way Ronsard verbalizes nouns in the last line so that “planer” means ‘to make a plain’ and “montaigner” means ‘to make mountains’. It’s a reminder that French has never been a language comfortable with new words or new uses of old words! Planer les monts, et montaigner les plaines. The Orient with its sweet breath. Des fleurs qu’Avril enfante en sa jeunesse. Par la vertu d’une œillade maistresse. Juge du mal que je souffre en aimant. Of the flowers that April has borne in her youth. Through the power of a masterful glance. Can judge the harm I suffer from being in love. Et dont amour est mesmes amoureux. Pour qui je vy, à qui seule je suis. Bien que pour elle Amour me desespere. With whom even love is in love. For her I live, whose alone I am. Although love for her makes me desperate. Blanchemain has in line 11 “Pour qui je vis…” (‘For her I live…’); I have assumed that the spelling chosen by M-L above has the same meaning, though it could perhaps mean ‘For whom I watch’? Qui d’un glaçon feroyent naistre une flame. Et par penser j’en deviens amoureux. O de mon cœur les meurtriers bien-heureux ! Plus longuement ou bien ne vous voir point. Which with a glance started a fire. Those sweet murderers of my heart! For longer, or else see you no more. Qui m’a blessé d’une fleche nouvelle. Quand le bon-heur me conduit aupres d’elle. Ha ! que ne suis-je en ce monde un grand Roy ? Mes yeux en fleuve, et mon cœur en rocher. Who has wounded me with a new arrow. When good fortune brings me near to her. O, how am I not a great king in this world? My eyes into rivers, my heart into stone. In this case, though, the differences are minor: in line 3, her eyes are “le sejour d’Amour” (‘the resting place of Love’); and in line 10 “Elle seroit toujours aupres de moy” – ‘She should be always beside me’ (implicitly, rather than explicitly, as queen). Another variant sometimes encountered does away with the troublesome ‘Paschal’ of line one: “Je meurs helas…” (‘I die, alas, …’). Paschal is (perhaps) Pierre de Paschal, royal historian, (1522-1565). Faire à vos yeux de mon cœur sacrifice. Vivre sans mains, que ma main vous desplaise. Instead some ill in doing you service. To make sacrifice of my heart to your eyes. To live without hands, than that my hand should displease. Makes me happy when I kiss you. Your eyes could light a fire.